Michael Jantzen’s Solar Eclipse Pavilion is a sprawling steel sculpture designed to create a shady public meeting space. But instead of serving just one function the artistic installation is capped with a 7,000 square foot array of photovoltaic solar cells! 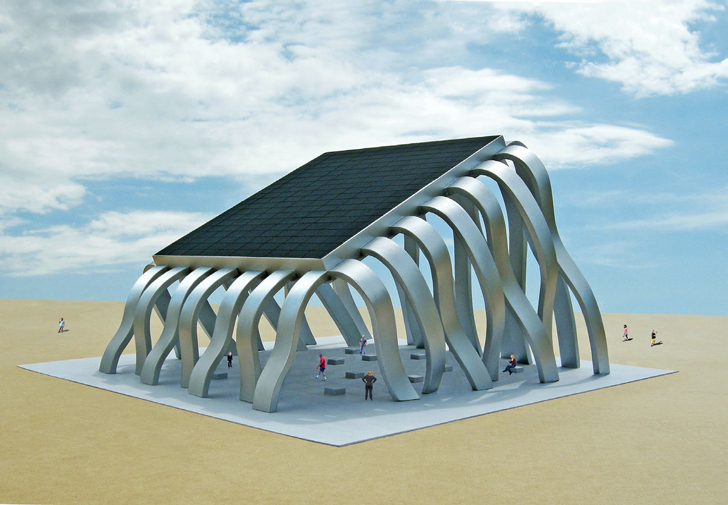 The energy harnessed from the solar cells would be pumped back into the local power grid, and also used to illuminate an LED screen on the sculpture. The low energy consuming screen is mounted on the underside of the tilted pavilion, giving visitors a view of its display when inside the pavilion. The screen displays are at the mercy of the sun’s activity. 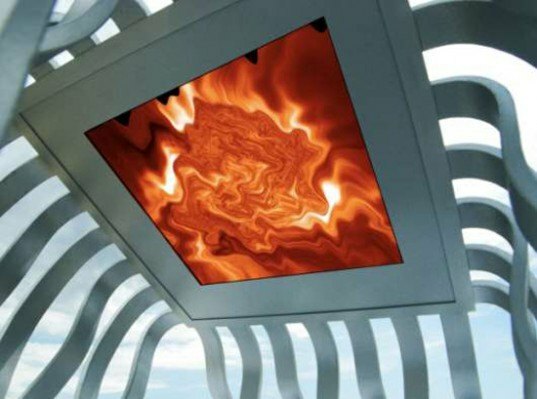 Colors and images of the sun displayed, which morph in response to random light and heat variations that are picked up by sensors placed throughout the roof’s solar array, then displayed in the pavilion below. Electronic sounds accompany the displays, which shift and change as the graphics on the display change from heat and light. At night, the Solar Eclipse Pavilion is still an attention grabber, playing back sights and sounds recorded from the sun earlier that day. Aside from providing solar energy, the pavilion shades the plaza below, giving relief to visitors on hot days. The pavilion can even be fine tuned for a specific event, acting as a covered stage. The LED displays and sound system can be hooked into a stereo system for live music and graphic display. Michael Jantzen’s pavilion creates a public space for events and relaxation, while also giving back to the energy grid of the community it is installed in. Michael Jantzen's Solar Eclipse Pavilion is a sprawling steel sculpture designed to create a shady public meeting space. But instead of serving just one function the artistic installation is capped with a 7,000 square foot array of photovoltaic solar cells!